Ohio Rep. Jim Jordan talks to reporters before a House Republican conference meeting Wednesday. Members are rallying to his side, despite his alleged awareness that an Ohio State team doctor was sexually abusing wrestlers when Jordan was an assistant coach. "Jim Jordan is a friend of mine," Ryan said. "We haven't always agreed with each other over the years but I have always known Jim Jordan to be a man of honesty and a man of integrity." Jordan has said that he is seriously mulling a run to replace Ryan when he steps down after the end of his term later this year. He is considered a long shot but the allegations from former college wrestlers could complicate things. Multiple wrestlers have told news organizations that allegations of inappropriate touching and other contact between the team doctor and the student athletes were widely known around the locker room. They believe Jordan must have known about it during the time when he was an assistant coach more than 20 years ago. NPR has not independently confirmed the allegations, and Jordan disputes the accounts. He says if he had known about the incidents he would have said something. And Jordan says the outpouring of support from fellow Republicans validates him. "I'm getting all kinds of support because it's the truth," Jordan said Wednesday. "Six coaches and all kinds of wrestlers have said the same thing I have. You know why they said that? Because it's the truth." The conservative House Freedom Caucus voted Tuesday night to officially stand behind Jordan as a group. Freedom Caucus Chairman Mark Meadows, R-N.C., told reporters after the meeting that the roughly 40 caucus members are unified. "We took a vote in there and it was unanimous," Meadows said. "Not a single dissenting vote on supporting Jim Jordan. Meadows raised questions about the motivations and the background of one accuser and he believes that Jordan would have spoken up if he was aware that something inappropriate was happening. "I think if the American people knew the individual I had the honor of calling my friend and serving with they would want more Jim Jordans in Congress," Meadows said. "Not less." The Freedom Caucus is not alone — even people who have disagreed with Jordan in the past say they want proof. Moderate New York Republican Rep. Peter King says without some documentation or other information, he doesn't see how the allegations will harm Jordan in his bid to rise in leadership. "Nobody wants the allegations there, but if they're not proven, it can make you a stronger candidate," King said. "If you stood up to it and show they're not true and you go forward." Even Jordan's closest rivals in the race for speaker — House Majority Leader Kevin McCarthy, R-Calif., and Whip Steve Scalise, R-La., — are both backing him up. Scalise was the first member of leadership to formally support Jordan. McCarthy followed soon after with a statement saying he believes Jordan "to be a good and honest man." "I believe Jim when he says if faced with charges of abuse, he absolutely would have acted," McCarthy said. "Everyone should be afforded due process in this very serious matter and I am glad there is an investigation underway of the despicable behavior by the Ohio State University doctor." The issue of sexual misconduct is particularly sensitive for House Republicans. They were stunned in 2015 when former Speaker Dennis Hastert was accused of molesting at least four boys when he was a coach. He later admitted the abuse and served time in federal prison. And Congress has dealt with a string of stories of lawmakers acting in sexually inappropriate ways in the wake of the #MeToo movement. Five House members have resigned recently amid accusations against them personally. But many Republicans, like Texas Rep. Joe Barton, say Jordan is being attacked because he's a powerful conservative. "If you're a back-bench, low-profile junior member you're pretty much left alone," Barton said Tuesday. "The higher profile you take and the more influential and effective you are, the more likely that someone on the left is going to make these type of attacks." And now to the House where a possible contender to be the next speaker faces a major setback. Allegations emerged last week that Republican Congressman Jim Jordan was aware that an Ohio State University team doctor was sexually abusing wrestlers more than 20 years ago. Jordan was an assistant coach at the time. Jordan is fighting back against the charges. NPR's Kelsey Snell has more. KELSEY SNELL, BYLINE: Personal scandals like the one facing Ohio Congressman Jim Jordan usually mean the end of a politician's career on Capitol Hill. But so far, House Republicans are rallying to his side. Jordan even has the support of House Speaker Paul Ryan, the man whose job he hopes to take. PAUL RYAN: Jim Jordan is a friend of mine. We haven't always agreed with each other over the years, but I've always known Jim Jordan to be a man of honesty and a man of integrity. SNELL: Jordan says he is seriously mulling a run for speaker. He is considered a longshot, but the allegations from former wrestlers could complicate things. Multiple wrestlers have told news organizations that allegations of inappropriate touching and other contact between the doctor and student athletes were widely known around the locker room. They believe Jordan must have known about it during the time when he was an assistant coach. NPR has not independently confirmed the allegations, and Jordan disputes the accounts. He says if he had known, he would have said something. And Jordan says the outpouring of support from fellow Republicans validates him. JIM JORDAN: I've been getting all kinds of support because it's the truth. I mean, six coaches and all kinds of wrestlers have said the same thing I have. You know why they said that? Because it's the truth. SNELL: He also received unanimous support from the roughly 40 members of the deeply conservative House Freedom Caucus, which he helps lead. Freedom Caucus chairman Mark Meadows told reporters that he questions the motivations and background of one accuser. Meadows said he just believes that Jordan would have spoken up if something inappropriate was happening and he was aware. MARK MEADOWS: I think if the American people knew the individual that I have the honor of calling my friend and serving with, they would want more Jim Jordans in Congress, not less. SNELL: It's an argument that a lot of Republicans are repeating. 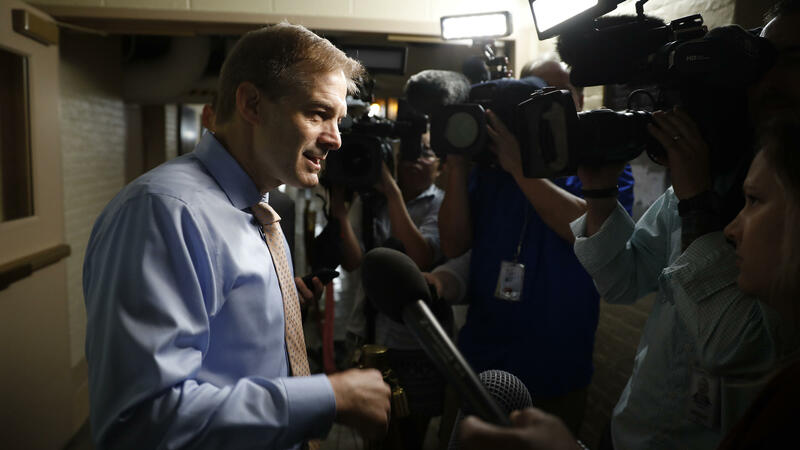 Conservative advocacy groups are pushing Jordan to run for speaker, and they insist that the accusations are false and meant to undermine him. Even people who have disagreed with Jordan in the past say they want proof. Moderate New York Republican Peter King says without some documentation or other information, he doesn't see how the allegations will harm Jordan in his bid to rise in leadership. PETER KING: Nobody wants the allegations there, but if they're not proven, it can make you a stronger candidate if you stood up to it and you showed they're not true and you go forward. SNELL: Even Jordan's closest rivals in the race for speaker, House Majority Leader Kevin McCarthy and Whip Steve Scalise, are both backing him up. The issue of sexual misconduct is particularly sensitive for House Republicans. They were stunned in 2015 when former Speaker Dennis Hastert was accused of molesting at least four boys when he was a coach. He later admitted the abuse and served time in federal prison. And Congress has dealt with a string of stories of lawmakers acting in sexually inappropriate ways in the wake of the #MeToo movement. Five House members have resigned recently amid accusations against them personally. But many Republicans, like Texas Congressman Joe Barton, say Jordan is being attacked because he's a powerful conservative. JOE BARTON: If you're a back-bench, low-profile, junior member, you're pretty much left alone, but the higher profile you take and the more influential and effective you are, the more likely somebody on the left is going to make one of these type of attacks. SNELL: So far, there's little evidence to back up Barton's claim that Democrats are to blame, but Republicans seem certain that Jordan will hold on. Kelsey Snell, NPR News, the Capitol. Transcript provided by NPR, Copyright NPR.